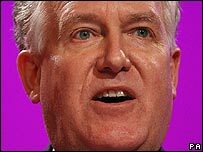 Peter Hain has said he failed to register a £5,000 deputy leadership campaign donation, blaming an "administrative error". The cash was a personal gift from Labour's chief fundraiser, Jon Mendelsohn, and is not connected to the current row over hidden donations. But the work and pensions secretary said he wanted to declare the money "in the light of recent events". It comes as police launch an investigation into Labour donations. In a statement, Mr Hain, the Neath MP who is also Welsh secretary, said: "In the light of recent events, it has come to my attention that a donation from Jon Mendelsohn to my deputy leadership campaign was mistakenly not registered with the Electoral Commission." The minister said "immediate steps" would be taken to ensure that the donation, which was made before Mr Mendelsohn became the party's fundraiser, would be registered. The Metropolitan Police are to investigate who knew about money being channelled to the party through proxy donors acting for wealthy property developer David Abrahams and whether any laws have been broken. Mr Abrahams gave cash to Hilary Benn's failed deputy leadership campaign under his own name. Mr Brown's leadership campaign was sent a cheque for £5,000 by Mrs Kidd, one of Mr Abrahams' intermediaries, but destroyed it because nobody in the campaign team knew who she was. But Harriet Harman, who won the contest to be Mr Brown's deputy, accepted a £5,000 donation from the same source during the deputy leadership race she eventually won. Ms Harman said she had no idea the money really came from Mr Abrahams, and had accepted it on the basis that Mrs Kidd was a known Labour donor. She said she acted in "good faith". Labour's general secretary Peter Watt has already resigned over the row, saying he knew about Mr Abrahams' funding arrangement, but did not think it broke the rules. Mr Mendelsohn has said Mr Watt had told him about it last month but he had been unhappy about it and had contacted Mr Abrahams with the intention of putting his donations on a proper footing.